If you are looking extensively for luxury transportation service in the Detroit area, then breathe a sigh of relief, because your search ends here. Detroit Trolley is stock full of exceptionally beautiful trolley cars that can seat up to 22 passengers, along with several stunning party buses and limousines. Our trolley cars are perfect for almost any type of event possible - including weddings, concerts, birthday parties, nights out in Motown, bachelor and bachelorette parties, and many more! You'll find that each of our vehicles are proudly driven by a professional chauffeur that will reliably and happily take care of your every need. We have the newest, latest, and greatest GPS systems equipped in all of our vehicles, to ensure that our drivers are able to take you exactly where you need to go without the hassle of asking for directions. Get a group of friends together and explore Detroit while having fun on one of our vehicles. If you have any questions or would like to start the process of reserving your trolley car, party bus, or limousine, give us a call and we will take care of you right away! Take a trip down Woodward Avenue and enjoy the sights and sounds of the Motor City. You will find that despite the bad press regarding this lively city, that there is much to see and to do here. Motown is starting to make a come back faster than ever before and the people here are working diligently in making sure that their beloved city is the talk of the town. You'll find places like the Fox Theater hosting a variety of shows to enjoy, and the new Q-Line will transport you around if you decide to walk about the city. Take a tour of the local museums and learn about the history of this major metropolis. Don't take our word for it; simply pick a day to go out and enjoy the new sights and sounds yourself! You won't be disappointed with the results of the revival taking place here. You will find that the perfect attention grabber for any event you can think of, is to have a Trolley Car for your transportation authority. They are simply unique, rustic, and beyond adorable in every way. They not only transport you around town in style, but also transport you a time long forgotten, when they were the staple of every major city throughout the United States. 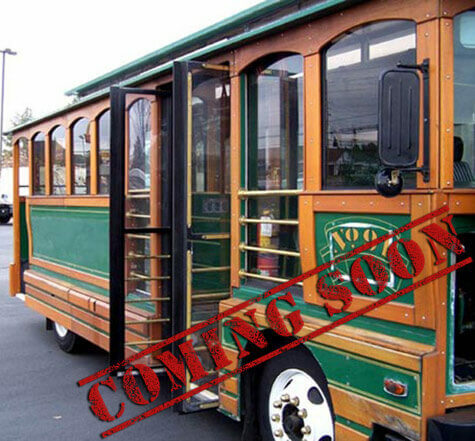 There are plenty of seats to be found in our trolley cars and you will have ample amounts of room for your guests to enjoy a historic ride in the making with you. There's simply no better way to stand out, and enjoy the ultimate fun ride for your big event. While they may not actually be a trolley on rails, you'll find that simply won't matter once everyone sees what you're pulling up in! We've got every angle of authenticity covered (except for the rails, of course), from the fine grade wood accents, the arched windows, to the broad windows to view the sights as you're cruising around. You'll even get to revel in the comfy yet authentic interior that we've painstakingly created to a level of realism that you'll be surprised at. Get in touch with us to find out more about how your trolley adventure can get rolling! 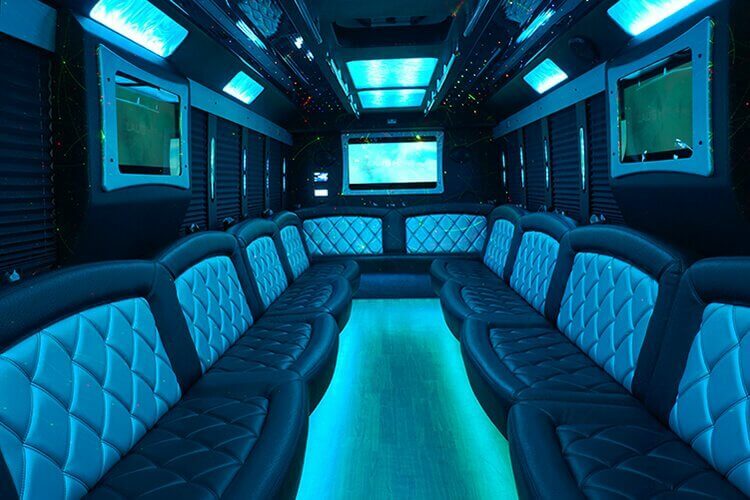 If you are looking to have an actual 'club on wheels', then look no further than our very own Party Buses! They are perfect for the party-goers who enjoy having a good time with loud music, color changing lights, and much more. 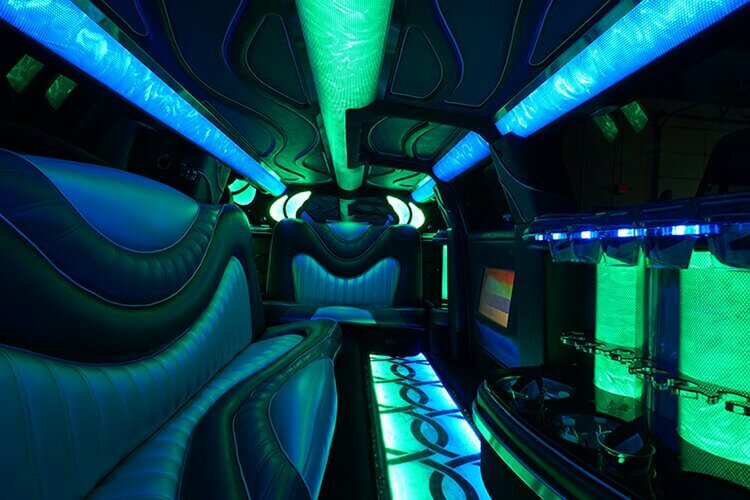 You'll find that our stylish buses will come fully stocked with plenty of amenities that will keep your party going late into the night while cruising around the metro areas of Detroit. Get your party started right by hiring one of our fantastic buses of fun for your next party adventure! Elegant, regal, stunning, fabulous, dignified, sumptuous... These are just a few of the adjectives that many people associate Limousines with, and you will find that each and every single one would accurately describe our limousines perfectly. They are the ideal vehicle for classy events such as weddings, romantic nights out, and more. You will find that they not only are seen as luxurious, but that they in fact are luxurious, through and through. With supple leather seating, tinted windows for privacy, and stocked coolers to keep your champagne icy cold; you will find that there is no other parallel for extreme pleasure in hired transportation. Show off your chic side and take a ride with us! Detroit is the most populous city in Michigan. In the early 21st century, the Detroit area held roughly half of Michigan's population. Detroit is known for many things, from the Detroit River, Motor City, Motown, and sports teams like the Tigers, Lions, and Red Wings. Those who live in the Detroit area, love it and everything about it. Those who don't live in the area, really have to come visit to really understand how special Detroit is. Detroit has many places to visit and lots of annual events that happen, especially in Campus Martius Park. There is something for everyone in Detroit. Get a trolley or a party bus and explore!